The threat posed by climate change and the cost of inaction are undeniable. Climate change and its effects include: less habitable coastal regions due to rising sea levels, entire cities underwater from floods, homes and centers of commerce destroyed, devastating weather events that worsen every year, and water and food scarcity. Policymakers in the United States must confront this existential crisis head on, and time is of the essence. Scientists warn that we have underestimated the threat of climate change and that to avoid major catastrophe, we must immediately reduce our emissions and become carbon neutral by midcentury. Thankfully, now more than ever, policymakers and the public agree we can no longer do nothing in the face of these challenges. Many new Members came to Congress to work on climate change. Now, many have endorsed the Green New Deal as an aspiration for the nation. They bring a new energy and experience to an issue that many of us have a been working on for some time in the committees of jurisdiction and the many caucuses concerned with climate change. And though the new Congress has a new opportunity to act, the challenge is not new, and we don’t start from zero. 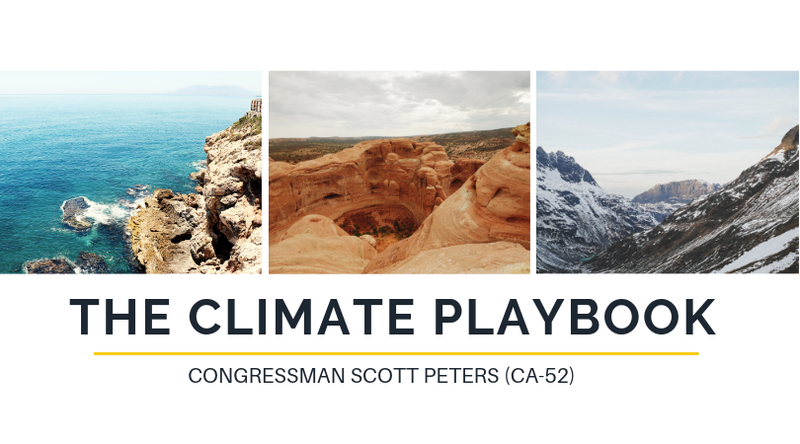 The Climate Playbook lays out dozens of bills authored by both Democrats and Republicans, most of which have already earned bipartisan support. They are written, they are ready, and we can pass them right now in their committees of jurisdiction and on the House floor. Because many have bipartisan support, it is feasible that many of these ideas can become law. These legislative proposals together take immediate steps to reduce greenhouse gases and slow — even reverse — the effects of climate change. They are organized into a range of categories that include ways to: reduce emissions from a variety of economic sectors; promote energy efficiency; reduce pollution; increase investment in research and development; spur more investment in adaptation and resiliency; develop a workforce to make all this possible; and support workers and communities displaced or impacted by this transition to clean energy. To be clear, these initiatives are only the beginning of a conversation on climate action now. If these bills need to be improved, we can do that. If we’ve got gaps to fill, we can propose additional legislation. We are long past the debate about whether climate change is real and how devastating its impacts are. Now it’s time to work with our colleagues, experts, academics, and our communities about what we’re going to do about it. 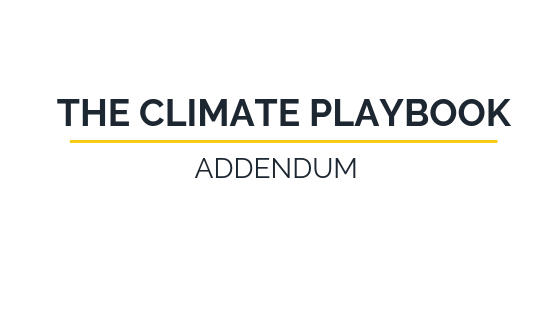 The Climate Playbook will live on my House website with complete transparency so anyone who wants to can read it, critique it, or make suggestions. We have simultaneously created an online forum for scientists, academics, and other legislative staff who can use it to ask questions and offer new solutions. This can operate as a salon to identify and solve distinct challenges posed by climate change and by the solutions themselves. In 2017, I had the privilege of speaking before world climate experts at a conference convened by Pope Francis in Vatican City. Our faith leaders remind us that we have a moral imperative to act today and that we cannot afford to be ideological or self-righteous in the face of this enormous challenge. Nor can we afford to be exclusionary or partisan in our approach. We must work together and seek common ground. If we attack new ideas simply because they are not our own, we risk missing out on this historical opportunity. Tackling climate change is an opportunity. It is an opportunity to increase our energy independence, to raise Americans’ standard of living, to ensure that future generations have access to clean air and safe drinking water, and to develop a workforce of the future to make all this possible. I look forward to working with my colleagues to take climate action now. The United States must take immediate, coordinated action at all levels of government and in partnership with countries around the world to prevent the average global temperature from increasing beyond 1.5 degrees Celsius. The bill would direct the President to develop a plan for the United States to meet its nationally determined contribution under the Paris Agreement. The bill would establish the bipartisan National Climate Solutions Commission which will make recommendations on how to best reduce non-sequestered greenhouse gas emissions based on the findings of the scientific community. The commission will 1) undertake a comprehensive review of economically viable public and private actions or policies to reduce greenhouse gas emissions; 2) make recommendations to the President, Congress and the States; and 3) set goals for emissions reductions using estimated rates of reduction that reflect the latest scientific findings of what is needed to avoid serious health and environmental consequences. 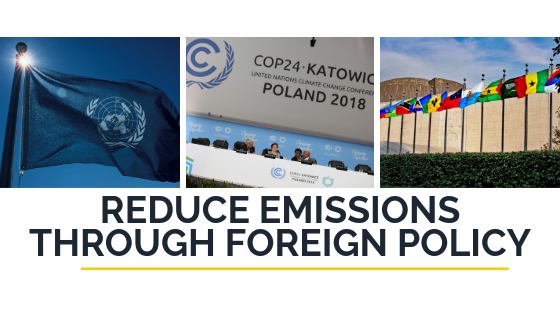 This resolution proposes a series of federal policies and programs, as well as fiscal and environmental reforms to achieve net-zero greenhouse gas emissions in 10 years, as well as for other purposes. 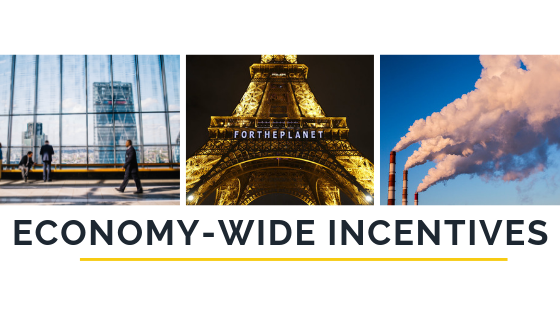 This resolution proposes a series of federal policies and programs, as well as fiscal and environmental reforms to achieve robust, economy-wide greenhouse gas emissions reductions, as well as for other purposes. Economists agree that a carbon tax “offers the most cost-effective lever to reduce carbon emissions at the scale and speed that is necessary.” To maximize the fairness and political viability of a rising carbon tax, all or a targeted portion of the revenue could be returned directly to U.S. citizens through equal lump-sum rebates, or rebates targeted to disadvantaged communities. The majority of American families, including those who need it most, will benefit financially by receiving more in “carbon dividends” than they pay in potentially higher energy prices. The bill puts a gradually rising fee on carbon-based fuels and products that emit greenhouse gases such as crude oil, natural gas, and coal. Fuel producers or importers will be required to pay a fee at a rate based on the greenhouse gas content of the fuel, which will begin at $15 in 2019, and increase by $10 each year. The rate could be adjusted based on progress toward meeting specified emissions reduction targets. 100 percent of the net revenue raised from this fee will be distributed dividends to households. The bill also amends the Clean Air Act to suspend certain regulations that limit greenhouse gas emissions. The suspensions expire if the emissions targets established by this bill are not reached after a specified period. This bill sets a fee starting at $50 per metric ton of emissions in 2019 to increase annually by two percent on carbon-based fuels, including coal, petroleum products, and natural gas; fluorinated greenhouse gases; emissions of any greenhouse gas from any greenhouse gas emissions source; and associated emissions (attributable to venting, flaring, and leakage across the supply chain). The bill also allows a new carbon fee offset tax credit for the lesser of 6.2percent percent of earned income, or $800. The bill caps the emissions of carbon dioxide (CO2) from crude oil, coal, and natural gas. It also establishes a declining cap on the quantity of permits issued to reduce CO2 emissions until 2050, at which point the permits issued will represent an amount 80 percent below 2005 CO2 emission levels. Treasury must issue permits for carbon capture and sequestration of CO2 from covered fuels. Auction proceeds and penalties are returned to U.S. citizens lawfully present in the United States using the Healthy Climate Trust Fund established by this bill. The Environmental Protection Agency must regulate within 10 years all sources of greenhouse gases that are anthropogenically emitted. This excludes gases attributable to the production of animals for food. 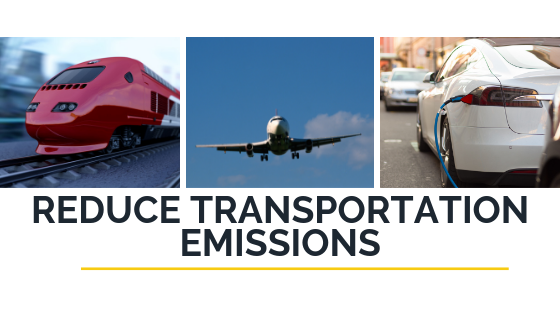 The transportation sector is the U.S. economy’s largest source of GHG emissions, accounting for about 29 percent of the total U.S. emissions. Options for aggressively reducing GHG emissions include using alternative fuels, such as biofuels and hydrogen, improving fuel efficiency, and modernizing the grid for electric cars. The bill would codify the Environmental Protection Agency (EPA) and the Department of Transportation (DOT) standards that were created in 2012 for light-duty vehicle greenhouse gas emissions and Corporate Average Fuel Economy (CAFE) for model years 2021 to 2025. The 2012 standards were created as part of an agreement between the agencies, auto manufacturers, labor, environmental groups, and interested states to reduce greenhouse gas emissions and increase fuel efficiency. The EPA estimated the model year 2022 to 2025 emissions rules would reduce U.S. oil consumption by 50 billion gallons, reduce greenhouse gas emissions by 540 million metric tons, and nearly double the fuel economy of passenger vehicles to an average of about 54 miles per gallon. This bill would reverse the Trump Administration’s recent actions to roll back fuel economy standards. This bill reauthorizes subtitle G of title VII of the Energy Policy Act of 2005, which relates to diesel emissions reduction and enables upgrades to the millions of diesel engines on our waterways, rails, and roadways, with the goal of improving air quality and living conditions for our communities. The bill extends the electric vehicle tax credit for 10 years, eliminates the per manufacturer cap of 200,000 vehicles, and provides a 10-year extension of tax credits to incentivize deployment of critical alternative fuel charging infrastructure. It also enhances consumer choice by allowing consumers to take advantage of the tax credit for the next 10 years or apply the credit at the point of sale. This bill amends the Internal Revenue Code to expand the definition of “qualifying income” (income that receives favorable tax treatment) to include income additional energy and related categories of business activity including: renewable and alternative energy generation projects, fossil fuel-based energy generation projects, infrastructure for transportation or storage, renewable thermal energy, waste to heat power, renewable fuels and chemicals, energy efficient buildings, gasification, and carbon capture in secure geological storage. This confers the same benefit to renewable energy generation as is today given to fossil fuel generation. This bill leverages private sector dollars from institutional investors, such as pension funds, to supplement current funding for our nation’s infrastructure. It would provide loans and loan guarantees to projects and issue Public Benefit Bonds, with proceeds funding projects and making payments to help states and localities cover their bond interest payments. The National Infrastructure Bank would finance surface transportation projects, as well as energy, environmental, and telecommunications projects. The bank would consider each project’s economic and environmental impacts, social benefits, and costs objectively before selecting projects to finance. According to the Energy Information Administration (EIA), CO2 emissions in the U.S. rose by almost 3 percent in 2018. While coal consumption in the U.S. is steadily declining, natural gas and petroleum will remain dominant sources of energy used in the U.S and abroad. Decarbonizing the power sector will require a combination of investments in low-carbon, renewable, and zero-carbon emitting technologies, as well as reforms to the energy market to accommodate a successful transition to a clean energy economy. The USE IT Act is a bipartisan, bicameral bill that supports the development and demonstration of vital carbon capture and removal technologies. 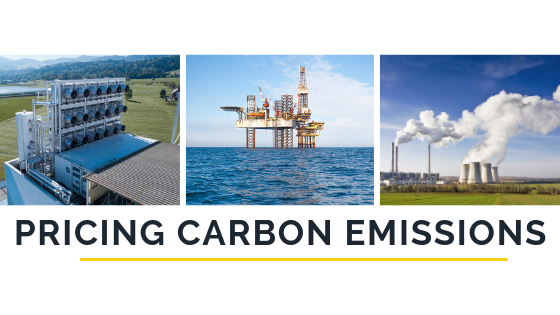 Carbon capture and sequestration are existing technologies that capture and sequester CO2 from such emitting sources as biomass or fossil fuel plants. Emerging direct-air capture technologies remove CO2 emissions from the atmosphere and turn the CO2 into valuable materials and products, including plastics, chemicals, building materials, and fuel. This bill authorizes $35 million in competitive prize funding for direct air capture technologies and allocates $50 million toward research and development of technologies that transform captured carbon dioxide into commercial products. The USE IT Act also facilitates the construction and development of carbon capture, utilization and sequestration (CCUS) infrastructure projects. The bill promotes emerging net negative emissions technologies, particularly Direct Air Capture (DAC) technology. DAC technology prevents CO2 emissions by removing CO2 directly from the atmosphere. The Carbon Capture Improvement Act allows businesses to use private activity bonds (PABs) issued by local or state governments to finance a carbon capture project. These bonds are beneficial to consumers and businesses because of their tax-exempt status and because they can be paid back over a longer period of time. If more than 65 percent of carbon dioxide emissions from a given facility are captured and injected underground, then 100 percent of the eligible equipment can be financed with PABs. This bill amends the Public Utility Regulatory Policies Act of 1978 to add energy storage systems to the list of strategies states should consider when developing energy plans and using utility ratemaking authority. This bill would create a competitive leasing system for wind and solar energy on public land (like oil and natural gas programs). It will direct royalties from renewable energy projects into wildlife conservation funding and back into the states and counties. This bill directs DOE to facilitate and encourage public-private partnerships to improve cybersecurity of electric utilities. The legislation would improve sharing of best practices and data collection, along with providing training and technical assistance to electric utilities to address and mitigate cybersecurity risks. This bill creates a voluntary Department of Energy ‘Cyber Sense’ program that would identify and promote cyber-secure products for use in the bulk-power system. The bill also establishes a testing process for the products along with a reporting process of cybersecurity vulnerabilities. It would require the Secretary of Energy to keep a related database on the products. This would aid electric utilities that are evaluating products and their potential to harm the electric grid. The Grid Modernization Act would authorize new DOE demonstration programs to modernize the grid with storage, microgrids, and distribution-level investments in technology like electric vehicle chargers and advanced distributed generation. It also requires DOE to provide a series of “off-the-shelf” tools to local and state grid regulators to accelerate the adoption of new technology and grid controls. These tools would reflect the diversity of various states and include architectural analysis of the grid, performance metrics for new technology, and distribution network planning. This bill rebuilds and modernizes the nation’s infrastructure to expand access to broadband internet, rehabilitate drinking water infrastructure, modernize the electric grid and energy supply infrastructure, redevelop brownfields, strengthen health care infrastructure, create jobs, and protect public health and the environment. To the extent the electricity grid is modernized and made more efficient, the nation can both deploy more renewables and conserve energy overall, thereby reducing emissions from generation. Industrial activities such as cement and steel-making, both directly and indirectly produce significant CO2 emissions. 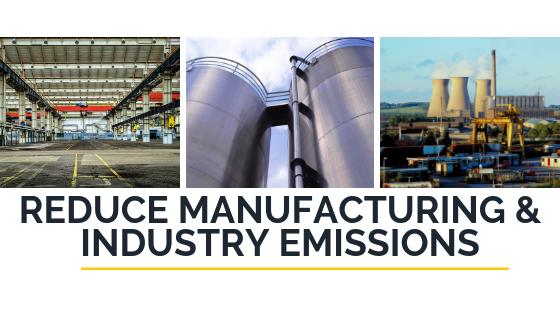 U.S. manufacturing alone accounts for 12 percent of U.S. GDP, 31 percent of all U.S. energy consumption, and 21 percent of annual greenhouse gas emissions. Promoting energy efficiency, less carbon-intensive fuels, and other mitigation technologies is key to quickly reducing emissions in these energy-intensive sectors. This bill provides tax credits for investments in energy and battery storage technologies. It amends the Internal Revenue Code to allow tax credits for: (1) energy storage technologies and (2) battery storage technology. The bill expands the tax credit for investments in energy property to include equipment that: (1) receives, stores, and delivers energy using batteries, compressed air, pumped hydropower, hydrogen storage, thermal energy storage, regenerative fuel cells, flywheels, capacitors, superconducting magnets, or other technologies identified by the Internal Revenue Service; and (2) has a capacity of at least five kilowatt hours. It also expands tax credits for residential energy-efficient property to include expenditures for battery storage technology. This bill requires the Department of Commerce to carry out a grant program for establishing consortia to enhance U.S. economic, environmental, and energy security by promoting domestic research and commercial application of clean technologies and advanced manufacturing processes. Clean technology means technologies, production processes, or methodologies that: produce energy from renewable energy sources; transmit, distribute, or store energy more efficiently; enhance energy efficiency for buildings and industry; enable the development of a smart grid (an evolving electric power network that utilizes new information technology systems, including those that enable customers to reduce or shift their power use during peak demand periods); produce an advanced or sustainable material with energy or energy efficiency applications; improve energy efficiency for transportation; or enhance water security through improved water management, conservation, distribution, or end use applications. The bill amends the Internal Revenue Code to allow expensing and accelerated cost recovery for certain energy efficient heating and air-conditioning property. It encourages the deployment of combined heat and power (CHP) and waste heat to power (WHP). CHP technologies utilize a variety of fuels, both fossil- and renewable-based, and WHP uses waste heat as the energy source. The bill applies to certain real property: (1) with respect to which depreciation (or amortization in lieu of depreciation) is allowable; (2) which is installed as part of the heating, cooling, ventilation, and hot water systems; and (3) which is within the scope of specified standards of the American Society of Heating, Refrigerating, and Air Conditioning Engineers and the Illuminating Engineering Society of North America. According to the U.S. Energy Information Administration, residential and commercial building sector in the U.S. accounts for almost 40percent of total energy consumption. 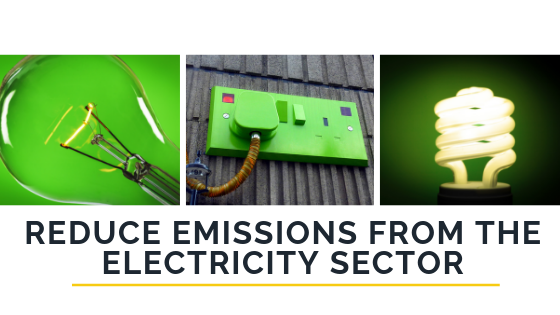 While there have been significant efficiency gains in commercial and residential buildings, such as homes, offices, schools, hospitals, increased use of appliances and electronics is expected to result in a net increase in emissions. The Technologies for Energy Security Act extends the Investment Tax Credit (ITC) to encourage the use of residential and commercial wind electrical generation systems by offsetting some of the cost of installation. It adds geothermal heat pumps, fuel cells, microturbines, small wind, and combined heat and power to the list of renewable energy technologies that qualify for the extended tax credits previously granted to solar and wind in 2015. This tax deduction is designed to help drive down the upfront costs of installing renewable technologies for homes and businesses. The bill adopts the same gradual tax credit phase-out schedule that Congress adopted for solar technology. Many of the recent energy efficiency incentive or support programs are structured in the form of tax credits and rebates. However, as tax-exempt entities, nonprofits are not able to take advantage of these programs. The bill would establish a pilot program to provide financial grants to non-profit organizations (schools, houses of worship, hospitals, youth centers, etc.) for energy efficient equipment and installation. Under the proposal, nonprofits could apply for grants up to 50percent of the total cost — up to $200,000. Schools spend about $6 billion a year on energy. According to the National Renewable Energy Lab (NREL), schools could save as much as $1.5 billion each year in energy improvements. 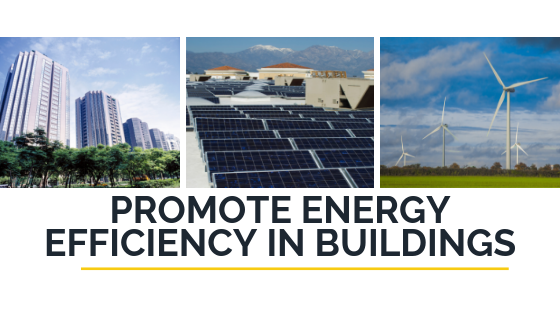 This bill directs DOE’s Office of Energy Efficiency/Renewable Energy to establish a clearinghouse on mechanisms promoting energy efficiency, distributed generation, and retrofitting projects for schools. Data centers and servers, computers, and smart devices are examples of some of the most energy-intensive information technologies. The federal government consumes billions of kWh hours using these devices and demand is only increasing. This bill promotes energy efficiency via information and computing technologies. It directs the OMB Director, Secretary of Energy and the Administrator of EPA to develop an implementation strategy for the maintenance, purchase, and use of energy-efficient and energy-saving information technologies by the federal government. The bill also creates Data Center Energy Practitioner Programs, Open Data Initiatives, International Specifications and Metrics, Data Center Utilization Metric, Protection of Proprietary Information. The bill passed the House in the 115th Congress. The Investing in State Energy Act requires certain financial assistance under the State Energy Program and the Weatherization Assistance Program to be distributed without undue delay to support state and local high-impact energy efficiency and renewable energy initiatives. This bill amends the Energy Conservation and Production Act to direct the Secretary of Energy (DOE), among other energy-saving measures, to: (1) support the development and updating of national model building energy codes for residential and commercial buildings to enable the achievement of aggregate energy savings targets established by this Act, (2) encourage and support states and local governments that adopt building energy codes that meet or exceed the national codes, and (3) support full compliance with state and local codes. 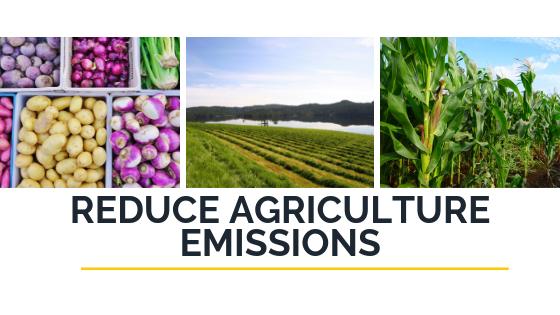 The agriculture sector contributes approximately 10 percent of total U.S. GHG emissions. Methane emissions from livestock, and certain soil and manure management practices are among some of the most potent sources of direct emissions from these agricultural activities. Improving these practices and establishing programs for robust carbon offsetting projects will be powerful market-based tools to significantly reduce emissions. The COVER Act amends the Food Security Act of 1985 to modify Department of Agriculture (USDA) conservation programs to authorize additional assistance for farm practices related to soil health and carbon storage. It also modifies the Environmental Quality Incentives Program to require USDA to provide funding for practices that: improve soil health; enhance the ability of a farmer to absorb and recover from shocks and stresses to production; increase the storage of carbon on agricultural land, and; achieve other conservation outcomes determined by USDA. The bill modifies the Conservation Innovation Grants program to establish a pilot program to provide payments to encourage: (1) the measurement of outcomes relating to planting a regionally appropriate cover crop, and (2) opportunities to increase farm income. In carrying out the program, USDA must prioritize certain projects with third-party partners such as academic entities, carbon offset protocol developers, livestock producers, and food manufacturers. The SHIPP Act amends the Food Security Act of 1985 to establish a voluntary soil health and income protection program. Landowners and operators may enroll eligible land in the program by agreeing to adopt certain practices to conserve and improve the soil, water, and wildlife resources of the land for three to five years in exchange for rental payments and additional crop insurance premium discounts. During the period of the agreement: the lowest practicable cost perennial conserving use cover crop must be planted on the enrolled land at the expense of the enrollee; the land may be harvested for seed, hayed, or grazed outside the nesting and brood-rearing period, but may not be insured and is subject to a 25percent reduction in rental payments if the land is harvested for seed; the land may be eligible for a walk-in access program of the applicable state; and a nonprofit wildlife organization may pay the owner or operator of the eligible land in exchange for an agreement not to harvest the conserving use cover. Beginning, small, socially disadvantaged, young, or veteran farmers and ranchers are only required to pay 50percent of the cost of planting the conserving using cover crop and are eligible for increased payments and crop insurance premium discounts under the program. A maximum of 15percent of the eligible land on a farm may be enrolled in the program. Almost half of manmade global warming results from certain lesser-known “super pollutants” that are many times more potent than CO2. These pollutants include short-lived climate pollutants, (which live in the atmosphere for a shorter time than CO2. Examples of super pollutants include black carbon (a component of soot), methane, and hydrofluorocarbons (HFCs). The U.S. 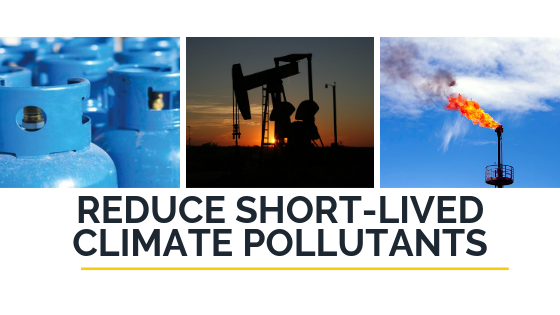 Climate Alliance identified a comprehensive set of cost-effective strategies to cut super pollutant emissions quickly. These strategies include capturing and utilizing methane, supporting better agriculture practices, avoiding waste, transitioning to more efficient, low emission refrigeration systems, and developing a national framework for transitioning away from HFCs. The SUPER Act defines “short-lived climate pollutant” as black carbon, methane, hydrofluorocarbons, tropospheric ozone and its precursors, or emissions from banks of ozone-depleting substances. It also creates a Task Force on Super Pollutants where representatives from federal, state, local, and tribal governments or associations, industry, and relevant academic and non-governmental organizations would review existing policies and measures to reduce emissions, promote efficiency and effectiveness, creating recommendations for best-practices and reporting back to Congress. Oil and gas producers want to bring as much natural gas to market as economically feasible. However, the costs to constantly monitor infrastructure for leaks are not always worth the savings due to the steep prices of some detection technologies. The bill authorizes further research into economical Leak Detection and Repair (LDAR) work, uses market forces to incentivize technology development and uses existing DOE resources to serve as an informational resource to support private sector mitigation efforts. This bill requires the Department of the Interior to publicly disclose the amount of fossil fuel and renewable energy production on public lands. They would measure fossil fuel production by using the 20-year and 100-year Global Warming Potential-weighted emission values. Renewable energy would be measured by comparing fossil fuel-generated emissions resulting from the same amount of energy. For this bill to be successfully implemented, the Department of the Interior should also promote regulations to ensure the accurate measurement and reporting of this data. The U.S. was once a global leader on climate change. To redeem our leadership position, the U.S. should immediately re-enter the Paris Agreement; meet our commitments to Canada and Mexico to reduce methane emissions from new and existing sources; and ratify the Kigali Amendment to the Montreal Protocol. To meet long-term climate goals, climate change must be addressed as one of the greatest threats to our national security. This bill would direct federal departments and agencies to ensure that climate change-related impacts are fully considered during the development of national security doctrine, policies, and plans, and for other purposes. In 2018, NOAA reported there were 11 weather and climate disaster events across the United States with losses exceeding $1 billion each. The federal government must provide state and local planners with the resources and information they need to develop and improve their extreme weather resiliency efforts. The bill directs the Department of Homeland Security to establish and chair an interagency working group with Cabinet-level representation from all relevant federal agencies to develop and improve their extreme weather resiliency efforts. The taskforce would develop a National Extreme Weather Resilience Action Plan. The DISASTER Act requires the Office of Management and Budget to submit an annual report to Congress on the amount of disaster-related spending by the federal government. The report must include all federal obligations related to disaster response, recovery, mitigation efforts, and administrative costs associated with these activities for specified agencies and programs. Incorporating climate data in standard developing organizations (SDOs) standards would help ensure the country’s infrastructure and homes can withstand the extreme weather events associated with climate change. 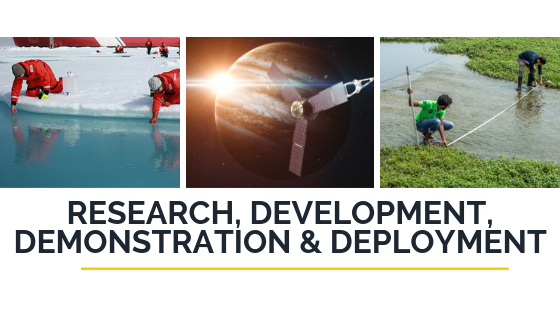 However, SDOs often find it difficult to find useful and relevant data, however, agencies like NASA and NOAA already possess cutting-edge climate change information. The bill would convene an interagency effort to improve federal agencies participate in the standard-setting process whenever there is a need for accurate climate change data and projections. The Coastal State Climate Preparedness Act amends the Coastal Zone Management Act to require the Secretary of Commerce to establish a climate change adaptation planning and response grant program for coastal states. This program would provide grants to coastal states to modify their current coastal management plans to address climate change impacts. 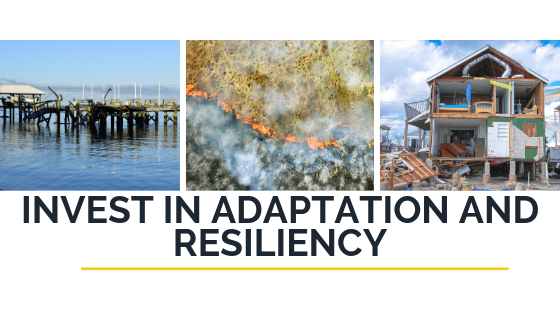 Additionally, states could use this grant funding to implement climate change adaptation strategies, such as identifying areas of greatest risk and developing performance measures for protecting infrastructure and coastal ecosystems. This bill would reauthorize the National Flood Insurance Program (NFIP) and make important reforms to the program. It would ensure flood insurance is affordable for policyholders by capping annual premium increases to 10percent, expanding policy coverage limits to $500,000 for homes and $1.5 million for multifamily and business structures, and requiring FEMA to provide financial assistance to any policyholders whose housing costs exceed 30percent of their adjusted gross income due to NFIP premiums. The bill also focuses on proactive mitigation efforts by investing in new Light Detection and Ranging (LiDAR) technology for more accurate mapping of flood risks. This bill phases out the use of large mesh drift gillnets off the coast of California and sets a path toward more sustainable fishing in the region. The bill also promotes the development and adoption of alternative fishing methods and gear types that reduce the incidental catch of living marine resources to the maximum extent possible. This bill amends the Food, Conservation, and Energy Act of 2008 to establish a Farm to Food Bank Network in a state or region by using a non-profit’s existing network and infrastructure to aggregate, transport, store, and distribute food. The bill would also take measures to provide food to those who need it, reduce food waste, and support farmers. This bill increases funding Authorization for the Bureau of Reclamation’s Title XVI water recycling competitive grant program from $50 million to $500 million. Priority will be given to projects that provide a more reliable water supply; increase water management flexibility and reduce environmental impact; and, make groundwater management enhancements. This bill requires the Secretary of Agriculture to establish a forest incentives program to keep forests intact and sequester carbon on private forest land of the United States. It would establish programs to encourage managing forests for carbon sequestration and for using bio-based products in building construction for purposes of carbon sequestration. This bill amends the Federal Ocean Acidification Research and Monitoring Act of 2009 to authorize a federal agency with a representative serving on the Interagency Working Group on Ocean Acidification to carry out a program that awards prizes competitively under the Stevenson-Wydler Technology Innovation Act of 1980. The prizes would recognize stimulating innovation to advance the nation’s ability to understand, research, or monitor ocean acidification or its impacts or to develop management or adaptation options for responding to ocean acidification. Priority must be given to establishing programs that address communities, environments, or industries that are in distress due to the impacts of ocean acidification. A transition to a clean energy economy will disproportionately affect low-income communities. The government will need to make substantial investments in worker dislocation programs, such as job retraining, income support, and a bridge to retirement for those workers directly employed in the U.S. coal and petroleum industry to keep the economy strong and to successfully transition the coal-based industry workforce into the renewable revolution. This bill amends section 211 of the Department of Energy Organization Act to rename the Office of Minority Economic Impact as the Office of Economic Impact, Diversity, and Employment. 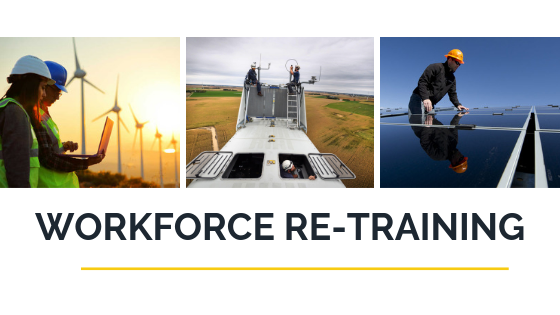 It creates an Energy Workforce Grant Program that will expand U.S. employment opportunities for minority workers in solar, wind, energy efficiency, clean vehicles, energy storage, and related clean energy jobs. The bill amends the Surface Mining and Reclamation Act of 1977 to make specified funds available to the Interior Department for distribution to states and Indian tribes to promote economic revitalization, diversification, and development in economically distressed communities. Based on the Abandoned Mine Land Pilot Program, the bill would fund the cleanup of abandoned coal mines (ending any methane leakage from the site) and repurpose them for economic use, creating jobs in the community. This bill directs the Department of Energy (DOE) to establish a National Center of Excellence for the 21st Century Workforce Advisory Board to (1) support and develop training and science education programs, (2) align apprenticeship programs and industry certifications to further develop succession planning in the energy sector, (3) integrate educational standards to develop foundational skills for elementary and secondary education and postsecondary education to create a pipeline between education and career, and (4) support the replication of existing model energy curricula. DOE would also establish a pilot program to award competitive grants to incentivize training for skilled energy industry jobs. Grant amounts are limited to $1 million for any one year. Federal government programs such as ARPA-E and the SunShot Initiative run by DOE have successfully accelerated the global deployment of transformational energy technologies. ARPA-E makes major investments in technologies that are too early-stage for private investment, while programs like the SunShot Initiative will make solar energy technologies more efficient, reliable and affordable. The government needs to urgently support every stage of energy innovation from energy research, development, demonstration and deployment. The Advanced Research Projects Agency — Energy (ARPA-E) is a program within the Department of Energy (DOE) that supports projects with the potential to transform our energy system and improve U.S. productivity and economic growth. In its eight-year history, 74 of more than 262 completed projects supported by ARPA-E have attracted over $1.8 billion in private sector follow-on funding, and 56 projects have gone on to form new companies. ARPA-E focuses on high-risk, high-reward, precommercial projects. Selected through a competitive application process, every project team receives funding and guidance to meet ambitious project milestones. Teams that fail to demonstrate success or meet milestones lose funding, ensuring funds are used efficiently and focused on the most promising projects. The Challenges and Prizes for Climate Act of 2018 directs the Secretary of Energy to take advantage of existing federal prize authority under the America COMPETES Act to spur innovation in five areas critical to combating climate change: carbon capture, energy efficiency, energy storage, climate resiliency, and data analytics on weather. The topics were selected with extensive input from stakeholders in the federal prize and clean energy communities. The bill will encourage public-private partnerships and pay-for-performance. The Nuclear Energy Leadership Act boosts nuclear energy innovation and ensures advanced reactors can provide clean, safe, affordable, and reliable power to meet national and global energy needs. The bill directs the Secretary of Energy to establish advanced nuclear goals; provide for a versatile, reactor-based fast neutron source; and make high assay, low-enriched uranium available for research, development, and demonstration of advanced nuclear reactor concepts. It aims to reestablish U.S. leadership in nuclear energy by launching robust public-private partnerships between the federal government, leading research institutions, and the best industry innovators. The bill also promotes education initiatives, workforce development, and training in nuclear science. The bill requires the Secretary of Energy, in coordination with other relevant agencies, to create an Energy-Water Subcommittee of the Secretary of Energy Advisory Board to help guarantee efficient, reliable, and sustainable delivery of energy and clean water resources. It also requires Secretary of Energy Advisory Board to oversee these activities with other agencies, nongovernmental organizations, and state and local governments to develop and regularly update a strategic plan which includes technical milestones for achieving and assessing progress toward these objectives. This bill authorizes a small business voucher program that will allow small businesses to conduct feasibility studies and analyze the innovation potential of new technologies by experts at the National Labs. The bill also streamlines the application and approval process for vouchers, eliminating barriers that prevent small businesses from exploring the potential of new technologies.